The project consists of two major components, the first being the ballpark and spring training facility for the Cleveland Indians and the Cincinnati Reds. The larger part is the mixed use commercial, retail, and office which includes hotel, restaraunt, and residential parcels. Wright Engineering’s role on the project was to prepare construction documents for five new traffic signals, public street lighting for 1.5 miles of roadway, and specialty lighting and electrical for the pedestrian areas adjacent the Ballpark. 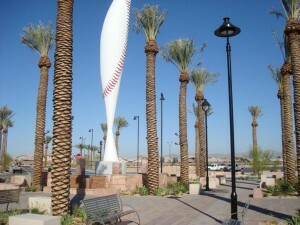 The project had an aggressive schedule to be constructed prior to the opening day of spring training. Wright Engineering delivered high quality construction documents on time and worked closely with the project team during construction to ensure on time delivery.